The colors of the rainbow are captured in this ring by Francisco Rebajes, highlighting the luminescence that naturally occurs in abalone shell and pearls. This adornment for the hand is composed of an adjustable silver band featuring a lustrous mass of shell from the abalone, a type of sea snail, combined with a baroque pearl as a focal point. 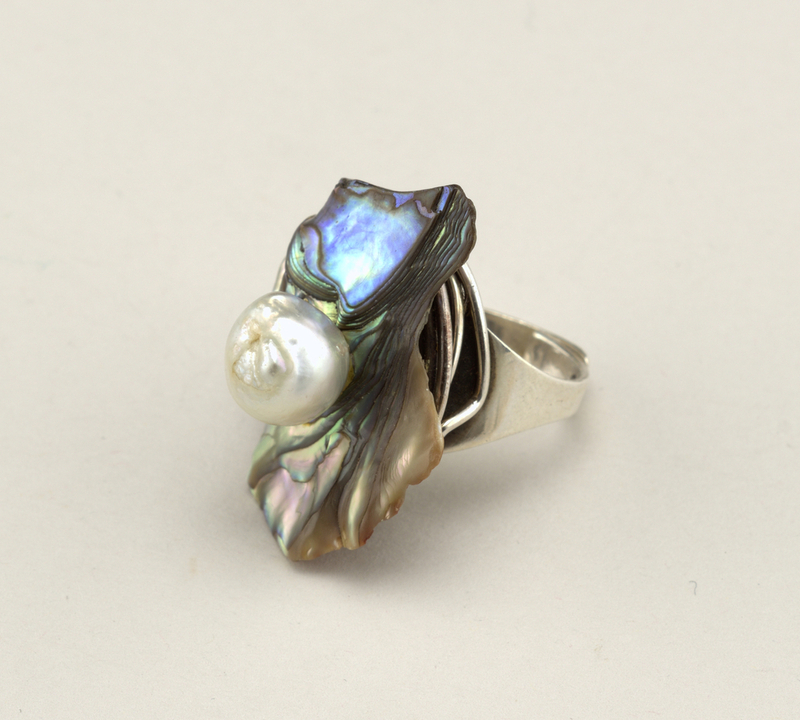 The iridescent inner layers of the shell, the nacre (also known as mother-of-pearl) differs from pearls which develop within the soft tissue of oysters. Traditionally, pearls are considered ideal if they are perfectly spherical and smooth. Baroque pearls are irregularly shaped, each one having a unique form and surface creating luscious optical effects. Here, Rebajes created a visual delight by using light and dark abalone topped by the creamy white tones of the pearl; this juxtaposition of the two materials accentuates the flood of colors, almost imparting a sense of holding a rainbow in your hand. This ring was made in about 1960, during a period of great artistic, cultural and stylistic changes, and represents a new outlook on jewelry design, one that recognized the move away from expensive, gem stone-based jewelry to artistic pieces that spoke of the mind and inspiration of the designer. Francisco Rebajes was among the first craft jewelers in Greenwich Village, having arrived in New York in 1922 from the Dominican Republic. Rebajes is recognized as one of the founders of the American wearable art movement. This group of jewelry artists included Sam Kramer, Art Smith and Paul Lobel, all working out of studios in Greenwich Village, and all creating a new style of adornment. By incorporating the pearl and abalone Rebajes connected the use of colorful gems in traditional jewelry with the artistic expression that was popular in the mid-20th century.